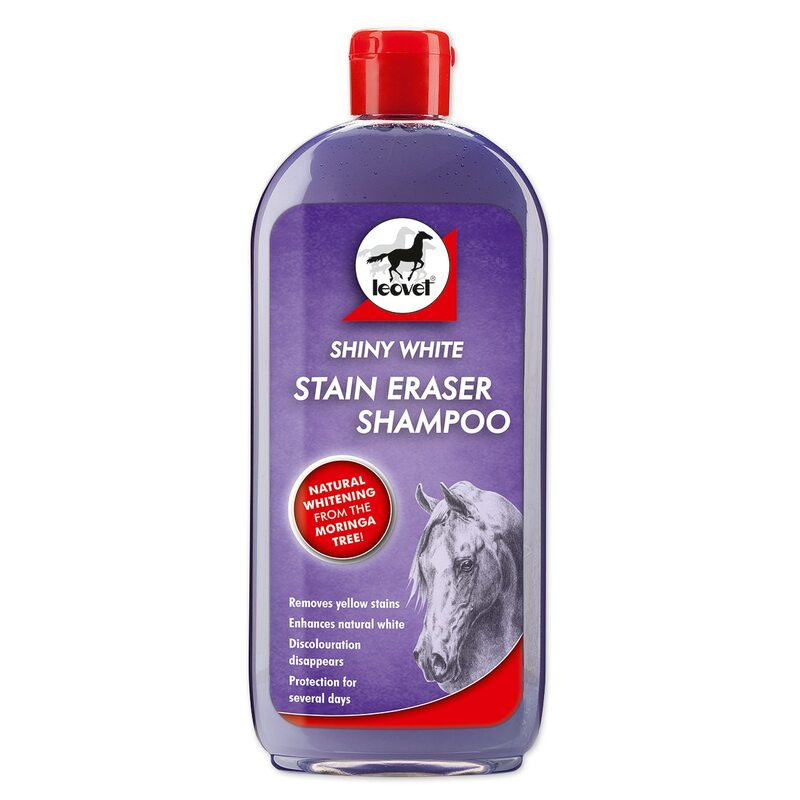 Leovet® Shiny White Shampoo has a gentle natural whitening effect for coats and manes. What truly sets this amazing product apart though is it's ability to prevent stains and discolorations for up to two day thanks to a complex protein from the African Moringa tree! Leovet® Shiny White Stain Eraser Shampoo (Formerly Shiny White Shampoo) is rated 3.8 out of 5 by 5. Rated 3 out of 5 by RRH88 from Just ok There are better whitening shampoos out there, but the stain prevention seems to work. The shampoo is light lavender color and not the dark purple that I’m used to with other brands. Rated 1 out of 5 by Elizabeth from Makes lots of suds; don't notice anything special I have a grey mare who likes get mud on the top of her poll and ears. This shampoo suds up like Ivory soap. I don't notice any difference between this shampoo and others that I have used. Do not notice any reduction in stains. Rated 5 out of 5 by HorseObsessed101 from Amazing Shampoo! This is an amazing product! I bought about a month ago for my grey mare and it worked out great!! 100% works! Don't let bad reviews fool you. Rated 5 out of 5 by blancosmom from fabulous for my mud man My grey gelding is rarely grey LOL I was so looking forward to his first 'bath' of the year, just to get the dirt off. This shampoo actually removed most of the stains too!! My boy is a roller and spends most of his nights laying down to sleep....so happy to have found this product. Rated 5 out of 5 by Be Irish from Only used once so far - but it worked great!! I was finally out of whitening shampoo, so thought id try this for the first time. I have only used it once so far, but it made a yellow tail WHITE on the first try! I like it! !